New Reek Cardis and Gos Desert Boots! Riq Graves of Reek and Gospel Voom of Gos Custom Design are two of my favourite male designers. They both excel at sculpting and texturing, producing consistently high quality, stylish and fun products. Today I am featuring a new release from each of these talented guys. 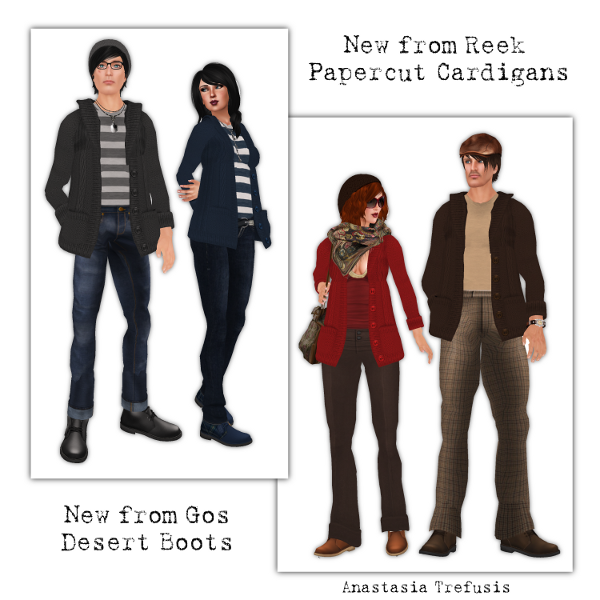 From Gos Custom Footwear, the brand new Desert Boots, and from Reek, the Papercut Cardigans. Since both items can be worn by both men and women, I created a couple of looks for each gender. The Desert Boots from Gos are as beautifully made and scripted as you would expect from Gos. If you fatpack, which I highly recommend, you can mix and match the soles, laces and boot colours. They come in a variety of colours in leather, suede and 2 tartans. I think Gos was surprised when I was so keen on these, as he was thinking of them as a men’s shoe. And they are a great casual men’s shoe, that perfect place between sneakers and dress shoes. But if you were around in the 80s, you will remember that women can and did wear these shoes too. I love them with these casual looks. Although they come sized for men, they are resize scripted you can easily size them down to fit a size 0 foot, as I did here. The Reek Papercut Cardigans are another great casual piece that will soon become a staple in your wardrobe. With an amazing 17 colours to choose from, these cardigans come with 3 styles of collar (plain, hood down and hood up), two styles of cuff (plain and rolled), and 2 body sizes for women. All the pieces come in men’s and women’s for one price. Both of these items are going to be solid staples of my fall wardrobe. Honestly I just kept making outfits with them, I probably could have shown you a dozen looks for women. The men’s not so much, but that’s only because I don’t have that many men’s clothes to make outfits with! For a limited time, you can scoop up the Gos Desert Boots in Sand for just 195L on the new Marketplace, all the other colours and the fatpack are there too, great to treat yourself or for gift giving! 2010 Shoe Fair of SL ends today 6pm! Today is the last day of the 2010 Shoe Fair of SL. We are 80,000L short of the 1 million linden goal that we had hoped to reach for the charity Soles4Souls. The sims will close today at 6pm SL time, so if you haven’t been yet, please go, buy some shoes, or even donate a few lindens if you can. This is a really great cause and you can pick up some fabulous new footwear while doing good, it’s a win-win! My look of the day is what I put together for the Shoe Fair Hillbilly Hoedown yesterday. I loved the outfit so much my av is still wearing it! You can pick up the Fringe Western Boots at the Anexx booth on Ruthenium. The pink ones will donate 100% to Soles4Souls. Head over to 2010 Shoe Fair of SL now! We have just 6 hours left to hit the 1 million linden goal! Some amazing sales are wrapping up over the next few days! Starting with fri.day! Everything is on sale, for 50, 75 or 100L! Including the brand new release Brande and Brande 2 hair shown here! Clothing, shoes, accessories, hair, everything’s on sale so get over there before the sale ends tonight! Zaara also has a huge sale on, aside from some newly released items all the jewellery and clothing is on sale for 50% off. I stocked up on all the jewellery that I’ve had my eye on, as well as some great clothing and this lovely bikini. Kyoot has a sale on until June 16th, I picked up a few things including the skirt in the centre, nothing over 100L so there are lots of great deals there too! L.Fauna skins are on sale! L$425 for one, L$1500/5 and the lips are colour change in appearance, so these are very versatile! I was unable to resist. Skins come with a cleavage version as well as freckled or unfreckled. A super good deal! Sale ends June 15th so you have a few more days to go and try out the free demos. Do try out the colour change on the lips too, I went for the darker lip on the Mulberry but I was amazed by the range of lip colours I can have on this one skin. The glasses are all new from Reek, the unisex Park Shades are colour change with a hud. They can be either sunglasses or clear, and are full of retro nerdy cuteness! The Kelly deck shoes shown in the second look are from A-Bomb, like all their shoes they are colour change! Get them now for L$150 – limited time offer so you should scoop them up quickly. They are perfect for all your casual summer looks and look great on both men and women. 10 colours for one price, can’t be beat! The gorgeous star jewellery shown in the first three looks is by Narita Rayna of Ticky Tacky, it’s a sneak peek of her new releases coming up at the next Black Baccanal on June 30th. Stay tuned for slurls and more details on this event. In the meantime, if you haven’t been to Ticky Tacky lately, you should go! Narita has a whole huge new store and lots of new releases. All poses are by Estetica, we are participating in some great events this summer, so we’re hard at work on new releases of poses and pose furniture, as well as some cute prefabs. New Reek Slides and new hair from fri.day! So the other day I headed out with Litzi, Ashlee and KawaiiNicole to take some snaps in Reek’s new sandals and socks. The search for a place where we could all rez enough to get some pictures without crashing took longer than planned. I still managed to snap the four of us in all our dorky hotness. As you can see, Reek has you covered for summer. We all dug out our Reek bikinis, board shorts, tees and some of the fun accessories for which Reek is so well known. This is a long post so please click through for all the details! The Reek Slides can be worn with or without socks, and come in 14 colour combinations. They are a sporty style slide sandal, with immaculate sculpted details, from the bumps on the sole to the stitching. There are 10 different sock colours included, and the toe on the sculpted foot of the socked version is colour change to match the socks.The insole is also colour change. I always love fri.day hair, and I came up with a couple of looks using Michelle that I will post later. It’s a nice laid back style that can look great at the beach, tucked under a hat or be dressed up. I think what I love best about fri.day hair is that it’s almost always something I can see myself enjoying in real life. I have been shopping up a storm this week and have lots of new pretties to share with you! Stay tuned!